A single luxury jewelry auction sells over seventy-eight million dollars of high-end jewelry. PoliceAuctions.com has a comprehensive listing of police auctions and government auctions where users will find a variety of jewelry and luxury items for auction. PoliceAuctions.com publishes a comprehensive listing of police auctions and government auctions, that often included seized jewelry and luxury items. On Tuesday at Sotheby’s Magnificent and Noble Jewels sale, six hundred and fifty lots were auctioned selling for a combined total of over seventy-eight million dollars, according to Forbes. Jewels belonging to screen legend Gina Lollobrigida alone sold for over four million dollars. Tuesday would also see a single pair of natural pearl and diamond pendant earrings sell for over two million dollars. For those not in the market for ultra high end luxury jewelry, PoliceAuctions.com publishes a comprehensive listing of police auctions and government auctions, that often included seized jewelry and luxury items. 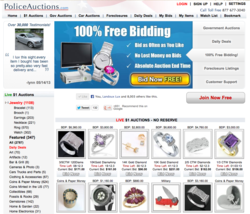 The listing informs PoliceAuctions.com users of the location, time, and date of police auctions and government auctions through out the country. Police auctions and government auctions are where the government auctions off surplus government equipment, seized property, and many other types of government property. This creates an eclectic and unpredictable assortment of items where participants are sure to find alternatives to multi-million dollar jewelry auctions.